INDIANAPOLIS -- With flash flooding and heavy rains hitting many parts of the country, thousands of cars have been submerged in high water. More than half of flood-damaged vehicles are resold, according to Carfax, a commercial web-based service that supplies vehicle history reports. Indiana State Police Sgt. 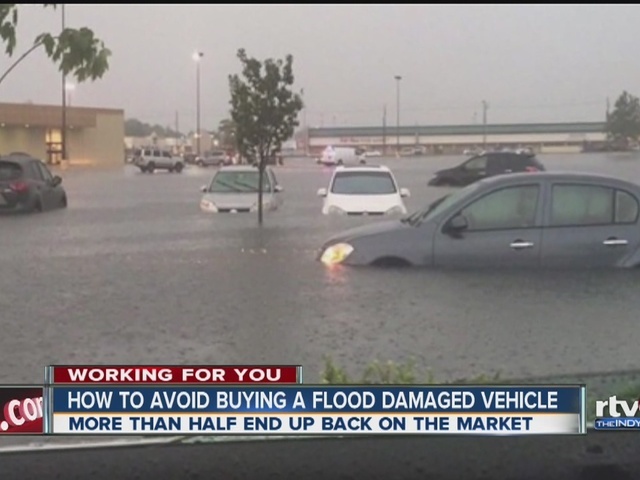 John Perrine said auto dealers and individuals can make a lot of money by buying a flooded vehicle from a junk yard or auction, fixing it up and reselling it to you. Auto dealers have to get salvage cars inspected by law enforcement before they can get a title, such as rebuilt or flood damaged. State police visually inspect cars to see if they’re safe to drive on the road, but say their inspections they are not a replacement for taking the car to a mechanic before buying it. “We’re going to check and make sure they’re not using stolen parts to resell it,” said Perrine. It’s perfectly legal for dealers and individuals to sell a flood-damaged vehicle, but the proper documentation must follow the car for its lifetime, Perrine said. More than 271,000 flood-damaged cars are back on the road in the United States, including more than 8,000 in Indiana, according to Carfax. Indianapolis-based WRTV also checked with the Indiana Bureau of Motor Vehicles, which has processed nearly 6,000 flood damaged titles over the last six years. Experts say you should do your research before you buy, including running the Vehicle Identification Number (VIN) through Auto Check, Carfax or similar services. While some websites charge a fee to run a vehicle’s history, others, like Carfax, will check for flooding history for free . Also, before you buy, take the car to a mechanic and have them check for water marks, rust and corrosion, as well as brittle wires. According to the Indiana Attorney General’s Office , a dealer should notify you in writing prior to purchase if the vehicle has a salvaged, rebuilt, or flood-damaged title, but only if the vehicle is seven years old or less.